We strive to produce and sell only healthy well adjusted animals. All the goats on our farm are CAE, Johnes, and CL negative. We test goats over the age of 6 months annually using the c- Elisa testing method. We will happily provide you with our latest testing data upon request. Maryland has earned the designation of being a TB & Brucellosis-free state so we do not test for those items. 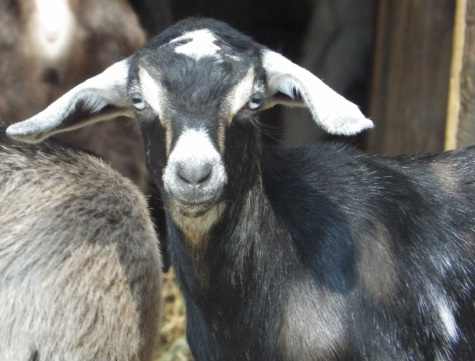 Mini Nubian goats in the Mid-Atlantic area are known to carry the G-6-S genetic defect so all of our stock is tested for this prior to breeding. We will only breed to G-6-S negative stock. Our goats are wormed as needed and receive annual CDT vaccinations. Kids will be disbudded (if appropriate)between 2- 4 days after birth, and given their CDT vaccines before they leave for their new homes. Kids can leave the farm between 8-12 weeks old, depending on their size and general heartiness. Kids will receive coccidia prevention treatment in their first 8 weeks. We trim our goat's feet regularly and give copper boluses annually as needed. Animals are guaranteed healthy when they leave our farm. Since we cannot control any stress that may occur as a result of travel or the animal's environment and care once it leaves our farm, we cannot offer any further guarantees. In the case of infertility, a replacement or refund will be given contingent upon a veterinary statement that the origin is genetic and the animal has received adequate care. We sell animals that are healthy at the time of transfer. A purchaser has the right to a full Veterinary examination at his/her expense on any animals to be purchased. We guarantee they do not have CAE, Johnes, or CL. For this guarantee, they must be tested within one week of arrival at your farm. We cannot hold any responsibility for the health of an animal purchased from us beyond 24 hours from the time it leaves the farm unless we are presented with a Vet's Certificate stating the goat's problem originated here. All sales are final and there are no refunds. You must report a problem with your goat within the first 24 hours. If you are unhappy with your goat, or unable to continue to care for your goat, then please contact us and we will see what we can do to help you. Your goat must be picked up by the agreed upon date (bottle baby, weaned, or specific date) that is agreed to when you put your deposit down. If you fail to pick up your goat at the agreed upon date, you forfit any rights to the animal, and we have the option to offer it to the next person in line, or place it back up for sale to another interested customer. We will strive to work with you to set up a date for pickup that is suitable for all involved. We want to help you get started on the right foot with your goat. We'll send you home with some grain and hay to help you transition to whatever food you choose. We provide a "New Goat Care and Tips" sheet to give you important information. . We are happy to answer any questions you might have, no matter how little. And we'll point you in the right direction if we don't know the answer. Kids are for sale on a first come, first serve basis. If you are interested in reserving a kid from a particular breeding, please notify us and you will be placed on the waiting list for that breeding. Once the kids are born you will be notified. If you decide to purchase the kid, a non-refundable deposit of $100 is required to hold a registered kid, $50 for an unregistered kid . We do have a paypal account set up to be able to receive payment. The balance is due in cash, or certified check upon pick-up. We will accept Paypal for final payment 1 week prior to animal being picked up. Paypal cannot be used the same day as pickup. The buyer is responsible for any other fees such as health certificate, any other testing desired. If you have some particular color you want please let us know. Occasionally we have adult goats for sale. Adult goats can be held for pick-up for one month with a non-refundable deposit of $100. If they need to stay longer we will board for $20/month. Adult does can be sold bred to one of our bucks for a modest breeding fee. The fee will depend on the buck. Please contact us for more information if interested. Eldamar Farm reserves the right to retain any kid born on the farm. We accept cash, paypal or certified check. Payment is due in full in cash when you pick up your goats or via paypal 1 week prior to pickup. Due to some unfortunate experiences, we do not take personal checks. We do not ship goats at this time. We offer discounts for 4H and multiple purchases. Please feel free to contact us to discuss further. We will occasionally permit buyers to take babies home as bottle babies at or before 2 weeks of age. Buyer is responsible for CDT vaccines (we will provide if requested). The goat will need to be disbudded unless you desire to have a horned goat. Disbudding is generally done within the first 2-4 days after birth. We can refer you to someone who can disbud your kid for you. Wethers must be returned to us at an appropriate age for castration. If the kid does not accept the bottle the buyer has 24 hours to notify us and return the goat to nurse until weaning. We will refund the purchase price within this 24 hour window if the buyer no longer wants the goat. Our health guarantee as stated above still applies. Bottle babies will only be sold if they are healthy. We cannot guarantee the health after they have gone to their new homes. If you have any questions about our reservations or sales policies, please contact us and we would be glad to assist you.